5 Prince Publishing - The Elvis Presley I Knew: Beyond the headlines and scandal to the heart of the superstar - Cantwell, Robert C.
All Shook Up! Productions - Off and Back On The Mystery Track - Meijers, Edwin J.
American Bar Association (ABA) Publishing - The Little Book of Elvis Law - Kuhne III, Cecil C.
AuthorHouse - The Elvis Interview: A Second Change - Allan, M.J.
Bantam Books - All About Elvis: The King of Rock and Roll From A To Z - Worth, Fred L. ; Tamerius, Steve D.
Bison Books Ltd. - Elvis - Kirkland, K.D. Boxcar Enterprises & JAT Publishing - Elvis, Aloha Via Satellite - Pirzada, Joseph ; Tunzi, Joseph A.
Busted Burd Productions - Hurry Home, Elvis Vol I (1962-1966) - Lewis, Donna ; Slanker, Craig A.
Busted Burd Productions - Hurry Home, Elvis Vol II (1967-1968) - Lewis, Donna ; Slanker, Craig A.
C.A. Productions - Viva Elvis! - Ares, Carlos R.
Century Hutchinson Ltd. - Elvis Close-up - Leviton, Jay B. ; Rijff, Ger J.
Corgi Books - Elvis: His Life From A To Z - Worth, Fred L. ; Tamerius, Steve D.
CreateSpace Independent Publishing Platform - Channeling Elvis: How Television Saved the King of Rock 'n' Roll - Wiener, Allen J.
Curtis Wood Publications - D. J. Fontana Remembers Elvis - Fontana, D.J. Custom Books Publishing - Iconic Voices - Harbinson, W.A. Dell Publishing - Starring Elvis - Elvis Presley's Greatest Movies - Bowser, James W.
Dutton - Down at the End of Lonely Street: the Life and Death of Elvis Presley - Brown, Peter Harry ; Broeske, Pat H.
Elvis Unlimited Productions - Elvis Is Back! - Murphy, Megan M.
Elvis Unlimited Productions - Inside Blue Hawaii - Murphy, Megan M.
Elvis Unlimited Productions - Inside GI Blues - Murphy, Megan M.
Elvis Unlimited Productions - Inside Graceland - Murphy, Megan M.
Elvis Unlimited Productions - Inside Love Me Tender - Murphy, Megan M.
Elvis Unlimited Productions - Inside Roustabout - Murphy, Megan M.
Elvis' Wild in the Country Club - Elvis Presley's Gold Cadillac - Tour of Australia 1968-69 - Hayden, Peter R.
First Cooper Square Press - Colonel Tom Parker - Dickerson, James L.
Glendale House Publishers - Elvis and Kathy - Westmoreland, Kathy ; Quinn, William G.
Hound Dog Books & Media - Elvis: Truth, Myth & Beyond. An Intimate Conversation with Lamar Fike. - McCullough, L.E. 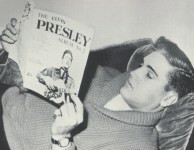 ; Eggers, Harold F.
Hyperion Press - The Inner Elvis - A Psychological Biography of Elvis Aaron Presley - Whitmer, Peter O.
I.B. Tauris - Elvis Religion: Exploring The Cult of The King - Reece, Gregory L.
JAT Productions - Aloha Via Satellite - Tunzi, Joseph A.
JAT Productions - Elvis '68 - Tiger Man - Tunzi, Joseph A.
JAT Productions - Elvis '69 - Featuring the Universal Picture Change of Habit - Tunzi, Joseph A.
JAT Productions - Elvis '69 - The Return - Tunzi, Joseph A.
JAT Productions - Elvis '70 - Bringing Him Back - Tunzi, Joseph A.
JAT Productions - Elvis '72 Bright Summer Nights - Tunzi, Joseph A.
JAT Productions - Elvis '73 - Hawaiian Spirit - Tunzi, Joseph A.
JAT Productions - Elvis '74 - Enter The Dragon - Tunzi, Joseph A.
JAT Productions - Elvis - Hawaii '61, Featuring The USS Arizona Benefit Show - Tunzi, Joseph A.
JAT Productions - Elvis 1970 In the Dome - Tunzi, Joseph A.
JAT Productions - Elvis Concerts - Tunzi, Joseph A.
JAT Productions - Elvis Dateline ... 1970 - Bringing Him Back Again - Tunzi, Joseph A.
JAT Productions - Elvis In Gold - Tunzi, Joseph A.
JAT Productions - Elvis In Tickle Me - Tunzi, Joseph A.
JAT Productions - Elvis No. 1; The Complete Chart History of Elvis Presley - Tunzi, Joseph A.
JAT Productions - Elvis On Tour - A Photographic History - Tunzi, Joseph A.
JAT Productions - Elvis Photographed Live on Stage in Charlotte and Memphis - Tunzi, Joseph A.
JAT Productions - Elvis Portraits - Tunzi, Joseph A.
JAT Productions - Elvis Presley And Nancy Sinatra On The Speedway - Lichter, Paul ; Tunzi, Joseph A.
JAT Productions - Elvis Presley As The One Called Charro! - Tunzi, Joseph A.
JAT Productions - Elvis Sessions II - Tunzi, Joseph A.
JAT Productions - Elvis Sessions III - Tunzi, Joseph A.
JAT Productions - Elvis Starring In Oklahoma - Tunzi, Joseph A.
JAT Productions - Elvis, America The Beautiful - Tunzi, Joseph A.
JAT Productions - Elvis, Encore Performance - Tunzi, Joseph A.
JAT Productions - Elvis, Highway 51, Memphis Tennessee - Tunzi, Joseph A.
JAT Productions - Elvis: The Documentaries - Tunzi, Joseph A.
JAT Productions - Encore Performance II: In The Garden - Tunzi, Joseph A.
JAT Productions - Encore Performance III: Back To Chicago - 1977 - Tunzi, Joseph A.
JAT Productions - Encore Performance IV: Back in the Windy City - Tunzi, Joseph A.
JAT Productions - Encore Performance V: One Performance Only, Featuring Chicago 57 - Tunzi, Joseph A.
JAT Productions - Flip, Flop & Fly - St. Louis to Atlanta 1973-1976 - Tunzi, Joseph A.
JAT Productions - For The First Time Ever - Tunzi, Joseph A.
JAT Productions - From St. Paul to Fort Wayne - Tunzi, Joseph A.
JAT Productions - Harum Scarum - The Book - Tunzi, Joseph A.
JAT Productions - Photographs and Memories - Tunzi, Joseph A.
JAT Productions - Return of the Dragon - Tunzi, Joseph A.
JAT Productions - Standing Room Only 1970-1975 - Tunzi, Joseph A.
JAT Productions - The Definitive Vinyl Artwork of Elvis Presley 1956-1977 - Tunzi, Joseph A. Jawbone Press - Return of the King: Elvis Presley's Great '68 Comeback - Gaar, Gillian G.
Manor Books, Inc. - Elvis: The Legend Lives - One Year Later - Grove, Martin A.
Memphis Belle B.V. - Elvis Remembered: De Geautoriseerde Boxset met Archiefmateriaal uit Graceland - Gaar, Gillian G.
Memphis State University Press - I Called Him Babe - Elvis Presley's Nurse Remembers - Cocke, Marian J.
Morgan Press, Inc. - Elvis 1956 Reflections - Kricun, M.E. ; Kricun, V.M. Omnibus Press - The Elvis Archives - Slaughter, Todd ; Nixon, Anne E.
Orion Books Ltd. - The Death of Elvis: What Really Happened - Thompson II, Charles C. ; Cole, James P.
Osborne Enterprises Inc. - Elvis, A 30-Year Chronicle - Burk, Bill E.
Phantom Printworks - I Called Him Babe - Elvis Presley's Nurse Remembers - Cocke, Marian J.
Phillips Entertainment Inc. - Elvis In the Beat of the Night: True Stories of Elvis and His Police Buddies - Ferguson, Robert H.
Pierian Press - Jailhouse Rock: The Bootleg Records of Elvis Presley, 1970-1983 - Cotten, Lee ; DeWitt, Howard A. Pocket Books Inc. - Wild In The Country - Salamanca, J.R.
Popular Culture, Ink. - Elvis: The Sun Years - DeWitt, Howard A.
Praytome Publishing - Elvis Live At Del Webb's Sahara Tahoe - McCasland, Sue ; Klein, Joseph A.
Presidio Press - Elvis In The Army - Taylor, William J.
Propwash Publishing - Early Elvis: The Humes Years - Burk, Bill E.
Propwash Publishing - Early Elvis: The Sun Years - Burk, Bill E.
Propwash Publishing - Early Elvis: The Tupelo Years - Burk, Bill E.
Propwash Publishing - Elvis Aaron Presley: A Candle In The Wind - Burk, Bill E.
Propwash Publishing - Elvis In Canada - Burk, Bill E.
Propwash Publishing - Elvis Through My Eyes - Burk, Bill E.
Propwash Publishing - Elvis: Rare Images of A Legend - Burk, Bill E.
Routledge - Elvis After Elvis: The Posthumous Career of A Living Legend - Rodman, Gilbert B.
Rowman & Littlefield - The Elvis Movies - Neibaur, James L.
Rutledge Hill Press - The Ultimate Elvis Quiz Book: what do you know about the king of rock & roll? - Moore, W. Kent ; Scott, David L.
Shelby House - Dot .. Dot .. Dot .. - Burk, Bill E.
St. Martin's Press - Elvis In Art - Taylor, Roger G.
St. Martin's Press - Letters To Elvis - McLemore, Patrick K.
T2K, Inc. - The Touch of Two Kings: Growing Up At Graceland - Stanley, Rick ; Haynes, Michael K.
Treasure Press - The Legend of Elvis Presley - Harbinson, W.A. Triumph Books - 100 Things Elvis Fans Should Know & Do Before They Die - Gaar, Gillian G.
Tutti Frutti Productions - Florida Close-Up - Leviton, Jay B. ; Rijff, Ger J. University of Illinois Press - Race, Rock, and Elvis - Bertrand, Michael T.
Vintage, Random House - Biggest Elvis - Kluge, Paul F.
W.H. Allen & Co. Ltd. - Images and Fancies - Tharpe, Jac L.
Warner Bros. Publications Inc. - The Hollywood Years - Weisman, Ben ; Schiff, Ronny S.
Wilhelm Heyne Verlag - Das War Elvis - Der König Des Rock 'n' Roll - Ever, Harry S.
iUniverse, Inc - Elvis '57: The Final Fifties Tours - Hanson, Alan R.
unknown publisher - South American Style - Ares, Carlos R.